A language is the essence of any customer service communication. Recent statistics on multilingual call center have claimed that around 74% of the customers would likely to engage with a company that offers customer sales support in their own native languages. It is the era of customer support and services. Offering maximum support to customers is all that matters. An expert knowledge in English while being snobbish in other languages won’t work in the current age of cut-throat competition. Customer Behavior: The behavior of the customer tends to vary from place to place. Not all customers behave in the same manner. For example; the people of Latin American countries usually prefer to engage in a telephonic chat with a telecaller for a long time while others are not. So, you can’t simply prolong your conversation with a Latin American customer using English – you will have to speak Spanish also as Latinos have a greater fluency in Spanish than English. Wider Market: The secret to a business success is its expansion. Every entrepreneur wishes to expand its customer-base. English might be widely spoken but not all customers speak the same. For example; it is futile to expect a Japanese customer speaks in English. 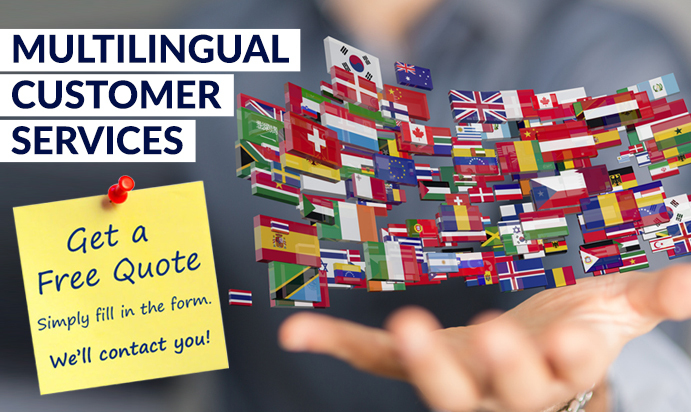 The latest statistics by International Customer Management Institute revealed that 70% of the customers gave positive feedbacks to firms offering Multilingual Customer Services and language interpretation options. Brand Loyalty: Believe it or not, the language has a magical power. The more telecaller talks to customers in their own languages more will be their prospect of becoming loyal to the firm. The latest study by ICMI revealed that around 58% of the customers are likely to become faithful to the brand if multilingual virtual call center converses more in their native languages with consumers. Love for Native Language: Mostly, customers want to explain their problems and doubts in their own native languages. It’s because they don’t want any language hindrance during a live chat. It is advisable to the telecalling agents to speak in native languages to people of non-English-speaking countries. Customers like to check details of the product or any feedback in their own local languages.